When Texas lawmakers meet next year, Lt. Gov. Dan Patrick is promising to again target a 2001 law that lets some undocumented immigrants pay in-state college tuition. The program affects only about 2 percent of Texas college students, but getting rid of in-state tuition for undocumented immigrants will be a priority for Republican Lt. Gov. Dan Patrick when lawmakers convene next year. Passed with near-unanimous consent in 2001, the policy allows non-citizens, including some undocumented immigrants, to pay in-state tuition rates at public colleges if they can prove they’ve been Texas residents for at least three years and graduated from a high school or received a GED. They must also sign an affidavit promising to pursue a path to permanent legal status if one becomes available. Debate around eliminating the program isn't new, but previous attempts to repeal it have fallen flat. The 2015 effort was Senate Bill 1819, by state Sen. Donna Campbell, R-New Braunfels, which passed the Veterans Affairs and Military Installations committee. Campbell's bill failed to make it to the full Senate, however, after a few Republicans withheld support, acknowledging there was no appetite for the measure in the Texas House. Supporters of the tuition break believe they'll need to be extra vigilant next year. “I think it’s a non-starter to repeal [in-state tuition] given the last legislative cycle, so I will absolutely not put it past the lieutenant governor and others to attempt to back-door a change to the rule in an attempt to make it less controversial,” said Miguel Solis, a member of the Dallas Independent School Board and president of the Latino Center for Leadership Development. Patrick “remains committed to eliminating in-state tuition for undocumented college students,” a spokesman said, though he would not comment on specific tactics the lieutenant governor might be considering. A spokesman in Gov. Greg Abbott's office referred to a previous statement saying the policy "as structured is flawed and it must be reformed." The office of House Speaker Joe Straus did not provide a comment for this story. Patrick has been sounding alarm bells since April about the skyrocketing costs of college tuition and vowing to make a variety of changes, including gutting a requirement that all four-year colleges set aside 20 percent of the tuition payments they receive to help needier students afford college. It’s through proposed changes like those, Solis said, that conservative lawmakers could get creative and find a way to eliminate the 2001 policy, passed as House Bill 1403. In 2015, supporters of eliminating the program cited the rising costs associated with the tuition policy. According to the original analysis of Campbell’s bill, the cost of providing tuition benefits for undocumented students had grown 68 percent since 2012. 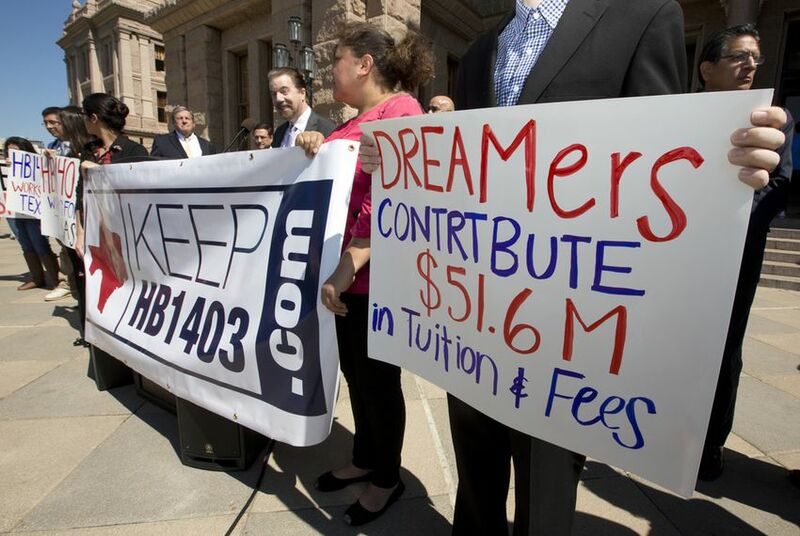 “If this rate continues, funding for in-state tuition for undocumented students will cost Texas taxpayers $100 million by the year 2020,” the analysis stated. The analysis also alleged that the in-state benefit helps take slots at four-year universities away from U.S. citizens and entices people to come to the state illegally. But program supporters say immigration status has nothing to do with the admissions process. They also point to the low number of students in Texas that have taken advantage of the program. According to the Texas Higher Education Coordinating Board, only about 2 percent of the students enrolled in Texas colleges benefited from HB 1403 in 2013. And a 2015 Texas Tribune analysis found that most of those, about 72 percent, were enrolled in community colleges as opposed to four-year universities. When only four-year universities are considered, only one, the University of Texas-Pan American beat the overall state average in 2013. That year, 771 students, or 3.8 percent of its student body, benefited from the in-state rate. That was followed by the University of Texas at Austin’s 1.46 percent. But opponents of the tuition rate argue the enrollment figures don't matter when the policy prioritizes people who have entered the country illegally over authorized immigrants or citizens. "Whatever it is you tolerate, you're going to get more of," said JoAnn Fleming, the executive director of Grassroots America - We The People, a conservative think tank. "I think citizens should come first. "If [undocumented parents] want their children to get in-state tuition, maybe they should make sure they're legal residents first." In his most aggressive terms yet, Lt. Gov. Dan Patrick excoriated Texas universities for raising their tuition in recent years, suggesting that the Texas Senate will try to limit tuition growth when it reconvenes next year. Amid legislative efforts to repeal in-state tuition for undocumented students, one figure is rarely mentioned: 2 percent.